Owing to the large repertoire of distinct T cell clones, the frequency of naive CD4+ T cells with a given Ag specificity is exceedingly low in a host organism (1 in 105–106) (1), whereas pathogens can potentially invade via numerous epithelial surfaces. This poses a considerable logistic challenge for the adaptive immune system, which is how rare Ag-specific T cells manage to find cognate peptide-MHC (pMHC)-presenting dendritic cells (DCs) within lymphoid organs. Studies using intravital two-photon microscopy (2PM) have uncovered high parenchymal motility of T cells within the lymph node (LN) paracortex, where they move with average speeds of 10–15 μm/min (2–5). Using synchronized dwell times for adoptively transferred T cells and controlled pMHC levels, three phases of cognate CD8+ T cell–DC interactions have been identified. In phase 1 (0–8 h post–T cell entry into LNs), CD8+ T cells gradually slow down and sequentially contact pMHC-bearing DCs for short periods of time (<5–10 min) for signal integration through motile kinapses (6, 7). 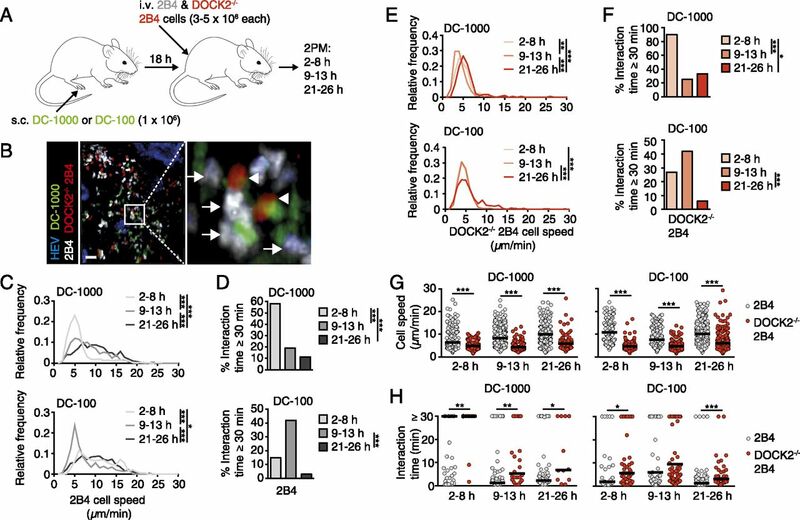 Phase 2 (8–20 h postentry) is characterized by prolonged CD8+ T cell–DC interactions (≥30 min duration in 2PM videos) and strongly decreased motility, presumably reflecting bona fide immunological synapse (IS) formation. In phase 3 (>20 h postentry), CD8+ T cells detach from DCs, regain migration speed, and begin expression of early activation markers to prepare for cell division (8). Additional studies have uncovered that the duration of phase 1 correlates with Ag availability, because pulsing DCs with high pMHC levels led to immediate long-lasting CD8+ T cell interactions with DCs (9, 10). In contrast, CD8+ T cells do not engage in stable phase 2–like interactions with DCs pulsed with low pMHC levels at any time and interacted only through transient kinapses, yet without affecting early CD8+ expansion (11). Parallel to studies on CD8+ T cells, numerous studies have used intravital 2PM to examine dynamic CD4+ T cell contacts with DCs in reactive LNs and reported a wide variety of transient and stable interactions (8, 12–18). Yet these studies have not systematically addressed how Ag availability influences phase transitions during dynamic CD4+ T cell–DC contacts, because they were performed without synchronization of CD4+ T cell dwell times, making it impossible to determine the amount of signals received by individual CD4+ T cells, and/or the study design did not include a deliberate manipulation of pMHC levels on transferred DCs, and/or only one time point after CD4+ T cell transfer was analyzed. Therefore, it remains unclear to what extent CD4+ and CD8+ T cells show overlapping patterns of Ag-dependent contacts with DCs. Although many membrane-proximal TCR-triggered signaling proteins are shared between CD8+ and CD4+ T cells, coreceptor and cytokine signaling differ between these subsets, potentially imprinting distinct gene expression and interaction dynamics (19, 20). In agreement with this, CD8+ T cells require as little as 2 h of continuous TCR signaling to induce proliferation (21), whereas CD4+ T cells need TCR stimulation for 10–24 h for commitment to cell division (22–24). This raises the question of whether, in the absence of stable DC interactions, intermittent signaling is sufficient to induce CD4+ T cell proliferation as observed for CD8+ T cells (11, 25). In this context, 2PM studies have identified different DC search strategies of CD8+ and CD4+ T cells, with MHC class II expression prolonging CD4+ T cell dwell time per LN transit, whereas CD8+ T cell dwell time was unaffected by the presence of MHC class I (26). Taken together, it remains to be determined how pMHC levels control in vivo contact duration with DCs as part of the search strategy of motile CD4+ T cells. Computational modeling of adaptive immune responses suggests that high T cell motility has evolved for rapid scanning and identification of cognate pMHC-bearing DCs located along the stromal fibroblastic network (27–30). In contrast, recent data have shown that excessive ballistic migration hampers T cell activation by reducing their DC-scanning period (31). In agreement with this, early in vitro experiments have identified a disruptive influence of promigratory chemokines on T cell activation (32, 33). Furthermore, activated DCs efficiently accumulate around high endothelial venules (HEVs) (8, 34–36), allowing rapid interception of newly arriving T cells. Thus far, there is a lack of direct experimental evidence addressing the relevance of intrinsic T cell motility for efficient DC-mediated activation. Continuous T cell migration requires the coordinated activity of small GTPases, notably Rac-dependent F-actin polymerization in lamellipodia at the leading edge, coupled with Rho-mediated actomyosin contractility at the trailing edge (37). The activity of these small GTPases is tightly regulated by numerous regulators, many of them specifically expressed in hematopoietic cells (38). In particular, members of the DOCK family of guanine exchange factors (GEFs) and of the PI3K family play central roles in mediating lymphocyte polarization and motility by regulating small GTPase activity (39–41). In both CD4+ and CD8+ subsets, lack of the Rac GEF DOCK2 or its effectors Rac1 and Rac2 partially impairs homing to LNs and strongly reduces interstitial T cell scanning, whereas PI3Kγ signaling constitutes a DOCK2-independent complementary role by maintaining T cell directionality (42–44). Furthermore, DOCK2 acts downstream of TCR signaling to induce Rac-dependent TCR and lipid raft clustering at the IS, whereas PKC-θ and LFA-1 translocation was not impaired (45, 46). In line with this, DOCK2-deficient T cells proliferate less in vitro and show disturbed effector cell differentiation (45, 47, 48), and lack of DOCK2 in human patients leads to a severe early-onset immunodeficiency (49). Yet it remains unclear how DOCK2 or PI3Kγ modulates T cell–DC interaction patterns during priming and how this correlates with in vivo CD4+ T cell activation. In particular, the contribution of DOCK2 to dynamic DC scanning versus TCR signal integration has not yet been explored. In this study, we used 2PM of reactive LNs in mice to assess the impact of pMHC levels on DCs for their interactions with synchronized CD4+ T cell populations at different time windows after T cell transfer, comparing wild-type (WT) with PI3Kγ- and DOCK2-deficient CD4+ T cells. In particular, we exploited the strong decrease in intrinsic T cell motility in the absence of DOCK2 to comprehensively examine the hypothesis that lymphocyte migration is central to encountering cognate pMHC-presenting DCs in reactive LNs. From dynamic cell imaging, three-dimensional LN reconstructions, and in silico analysis, we identify migration-dependent and -independent mechanisms leading to T cell–DC encounters and activation. 2B4 and DOCK2−/− 2B4 mice on the B10 background, specific for MCC88–103, were described previously (45), whereas PI3Kγ−/− mice (50) were provided by Emilio Hirsch (University of Turin) and backcrossed for >10 generations to OT-II TCR-transgenic (tg) mice recognizing OVA323–339 on the C57BL/6 background (51). All mice used in this project were bred under specific pathogen–free conditions at the Department for Clinical Research, University of Bern or at the Theodor Kocher Institute. All animal work was approved by the Cantonal Committee for Animal Experimentation and was conducted according to federal and cantonal guidelines. mAbs conjugated to FITC, PerCP, and allophycocyanin against CD4, CD11c, CD25, CD69, and B220 were from BioLegend (San Diego, CA). PE-coupled CD86 was from BD Biosciences (Franklin Lakes, NJ). Fc receptor blocking mAb (clone 2.4G2) was produced in-house. The fluorescent dyes 5(6)-CFDA, SE (CFSE), 7-amino-4-chloromethylcoumarin (CellTracker Blue), 5-(and-6)-(((4-chloromethyl) benzoyl)amino)tetramethylrhodamine (CMTMR; CellTracker Orange), and BODIPY 630/650 were from Molecular Probes (Eugene, OR); the cell proliferation dye eFluor 670 was from eBioscience (San Diego, CA). Purified mAbs against CD62L (Mel-14) and PNAd (MECA79) were from nanotools (Freiburg, Germany). MECA79 was coupled to Alexa Fluor 594 or to Alexa Fluor 633 using a Protein Labeling Kit (Molecular Probes). LPS (Salmonella enterica typhimurium) was from Sigma-Aldrich (St. Louis, MO). CD4+ T cells were isolated from single-cell suspensions of secondary lymphoid organs (spleen and axillary, brachial, inguinal, and mesenteric LNs) using negative selection with magnetic beads (STEMCELL Technologies, Grenoble, France). Purified cells were labeled at 107 cells per milliliter with CFSE (2.5 μM, 15 min), CMTMR (5 μM, 20 min), eFluor 670 (2.5 μM, 15 min), 7-amino-4-chloromethylcoumarin (20 μM, 25 min), or BODIPY (3 μM, 20 min) and adoptively transferred by i.v. injection. For bone marrow harvest, the lower 2 cm of a 1000-μl pipette tip was cut off and placed into a 1.5-ml Eppendorf tube. One femur and one tibia of donor mouse with tips cut were placed per tube and centrifuged for 5 min at 5000 rpm. Bone marrow was resuspended in complete medium containing 10% of SP-20 cell culture supernatant expressing Flt-3 ligand. At days 7–10 of culture, DCs were activated for 24 h by addition of 0.5 μg/ml LPS. Differentiation and activation of bone marrow–derived DCs were confirmed by flow cytometry for CD11c, B220, and CD86. Activated DCs were fluorescently labeled, pulsed with MCC88–103 or OVA323–339 (107 cells per milliliter, 45 min, 37°C), and injected s.c. into footpads of recipient mice, as described in the figure legends. The popliteal LN of recipient mice was surgically exposed for 2PM imaging, as described (18). Imaging was performed using an Olympus BX50WI fluorescence microscope equipped with a 20× objective (NA 0.95) and a TriM Scope system controlled by ImSpector software (LaVision BioTec, Bielefeld, Germany). A Ti:Sa laser (MaiTai; Spectra-Physics, Santa Clara, CA) was tuned to 840 nm for detection of second harmonic generation of the collagen-rich capsule to define imaging depth and to 780 nm for excitation of the fluorophores. For simultaneous detection of four channels, emitted light was detected using 447/55-, 525/50-, 593/40-, and 655/40-nm bandpass filters and nondescanned detectors. To perform four-dimensional analysis of cell behavior in situ, z-stacks (11–16 images with 4-μm spacing) of areas from 200 to 400 μm2 were imaged every 20 s for a total of 30 min. Volume-rendered four-dimensional movies were reconstructed from the image sequences of z-stacks and analyzed using Volocity (Improvision, PerkinElmer, Cambridge, U.K.). Cell migration was tracked automatically but was controlled visually to assure accurate tracking. To focus on parenchymal cell migration, tracks within 20 μm distance of HEVs were excluded, as were tracks shorter than five time points. The average migration speed of each track was calculated from the x, y, and z coordinates of the object centroids. Interaction of cells was quantified by visual evaluation of image sequences; a contact of fluorescent signals of two cells that lasted for three time points or more was considered an interaction. Single cell suspensions were prepared in FACS buffer (PBS, 2% FCS, 10 mM EDTA). After Fc receptor blocking (clone 2.4G2, 15 min, 4°C), staining was performed in 100 μl of FACS buffer for 20 min at 4°C. Data were acquired on a FACSCalibur or LSR II (Becton Dickinson) and analyzed using FlowJo software. We simulated 500 24-h-long T cell tracks by sampling from control and DOCK2−/− T cell tracks analyzed by 2PM in the absence of DCs. As steps at higher velocities tend to have smaller turning angles, we drew combinations of speed, turning angle, and plane angle from the same step instead of drawing speed, turning angle, and plane angle separately. To additionally account for the correlation of velocity and turning angle, we repeatedly exchanged random steps of our samples, keeping only those exchanges that made the mean squared differences of consecutive speeds and turning angles of our synthetic track more similar to the same means of the measured tracks. We stopped exchanging when both means of the simulated track were smaller than those of the measured tracks. To simulate contact formation among a predefined number of synthetic T cells (nT) and a number of DCs (nDC), we randomly chose nT simulated tracks (nT = 100 in the simulations shown) and moved them to starting positions normally distributed around the center of a spherical T cell zone of 1 mm diameter for 8 h. We chose the SD of 150 μm, such that half of the WT tracks resided within the T cell zone for an average half-life of 11 h (43). We considered all steps of the track within the T cell zone, including re-entry, as residency time. We then checked, step by step, the distance to nDC static DCs uniformly distributed throughout the T cell zone. We considered proximity ≤ 15 μm as a stable contact and did not allow T cells to move on. We repeated the different simulations 50 times to obtain stable distributions of outcomes. This analysis was performed using open Python libraries for scientific computing (52–54). Peptide-pulsed DCs were fluorescently labeled with CMTMR, and 5 × 104 were injected s.c. into the hind footpad. After 18 h, 1 × 105 DOCK2−/− and 5 × 104 control 2B4 CD4+ T cells were labeled with CMFDA or BODIPY and injected i.v.. Popliteal LNs were harvested 8 h after T cell transfer, fixed overnight in 0.4% PFA/PBS, transferred to PBS for careful cleaning under a stereomicroscope, and embedded in 1.3% Low Melting Point Agarose (Invitrogen, Eugene, OR). Samples were dehydrated in 100% MeOH and cleared in benzyl alcohol–benzyl benzoate (1:2 ratio) overnight. Imaging was performed using a customized selective plane illumination microscopy (SPIM) setup equipped with five lasers (405, 480, 561, 593.5, and 635 nm), five bandpass filters (490/40, 525/50, 593/46, 628/30 and 670/30 nm), a 2.5× light sheet objective (NA 0.07), and a 5× detection objective (NA 0.12), as described (55). Volocity or Imaris software was used for the reconstruction of volume-rendered three-dimensional images, the detection of transferred cells, and distance measurements between T cells and their closest DCs. We used a Mann–Whitney test, a Kruskal–Wallis test, a Student t test, a Wilcoxon matched-pair rank test, or ANOVA (Prism; GraphPad) for statistical analysis. Significance was set at p < 0.05. We asked how cognate pMHC levels on DCs influence dynamic interactions with CD4+ T cells. We s.c. injected fluorescently labeled LPS-matured DCs pulsed with 100 or 1000 nM MCC88–103 peptide (DC-100 and DC-1000, respectively) into footpads of B10 mice 18 h before i.v. transfer of cognate 2B4 T cells. At early (2–8 h), intermediate (9–13 h), and late (21–26 h) time points after T cell transfer, we performed 2PM imaging of reactive popliteal LNs (Fig. 1A, 1B). Under DC-1000–priming conditions, 2B4 T cells immediately decreased their speed to 6.3 ± 3.8 μm/min (Fig. 1C, 1G), which was accompanied by rapid encounters with DCs around HEVs and prolonged interactions (58% of interactions were >30 min; Fig. 1D, 1H) in the first 2–8 h posttransfer (Supplemental Videos 1, 2). At 9–13 and 21–26 h posttransfer, 2B4 T cell speeds gradually increased to 8.4 ± 3.8 and 10 ± 4.3 μm/min (phase 2–phase 3 transition), which was accompanied by the loss of stable T cell–DC interactions (19 and 11% of all interactions, respectively, Fig. 1D, 1H). Dynamic regulation of CD4+ T cell–DC interactions by pMHC density. (A) Experimental layout. 2B4 and DOCK2−/− 2B4 T cells were transferred into mice that contained DC-100 and DC-1000. At the indicated time windows, 2PM of reactive LNs was performed. (B) Representative 2PM projection showing 2B4 and DOCK2−/− 2B4 T cells in a reactive LN containing DC-1000 2–8 h after T cell transfer. Stable interactions of 2B4 and DOCK2−/− 2B4 T cells with pulsed DCs are indicated by arrows and arrowheads, respectively. Scale bar, 30 μm. Frequency distribution of 2B4 T cells speeds (C) and percentage of DC interactions lasting >30 min (D) at the indicated times posttransfer. Frequency distribution of DOCK2−/ 2B4 T cells speeds (E) and percentage of DC interactions lasting ≥30 min (F) at the indicated times posttransfer. Individual track speeds (G) and interaction times (H) of 2B4 and DOCK2−/− 2B4 T cells with DC-100 and DC-1000 at the indicated times post–T cell transfer. Horizontal lines represent mean (G) or median (H). Data in (C)–(H) are pooled from two to five independent experiments with two to six mice per time point and DC-pulsing condition. Data in (C) and (E) were analyzed using ANOVA with the Bonferroni multiple-comparison test. Data in (D) and (F) were analyzed using a Kruskal–Wallis test with a Dunn posttest and include all interactions shown in (H). Data in (G) and (H) were analyzed using a Mann–Whitney U test. *p < 0.05, **p < 0.01, ***p < 0.001. We examined the impact of decreased pMHC levels on CD4+ T cell behavior under DC-100–priming conditions. Early after transfer (2–8 h), 2B4 T cells were actively scanning paracortical DC-100 with speeds of 10.8 ± 4.4 μm/min (mean ± SD; Fig. 1C, 1G), with only 15% of interactions lasting >30 min (Fig. 1D, 1H). At 9–13 h posttransfer, 2B4 T cells slowed down (7.6 ± 3.9 μm/min, Fig. 1C, 1G) and showed a higher percentage of stable interactions with DCs (41%), reminiscent of phase 2–like formation of synapses (Fig. 1D, 1H). After 21–26 h, most 2B4 T cells had regained their migratory speed (10.1 ± 4.1 μm/min, Fig. 1C, 1G) and detached from DCs (3% of interactions >30 min, Fig. 1D, 1H). At this time point, DC-100–primed 2B4 T cells had acquired a blast-like phenotype in 2PM reconstructions, in line with imminent cell division (Supplemental Video 3). Next, we explored how active DC sampling of CD4+ T cells is influenced by lack of the promigratory Rac GEF DOCK2 (Fig. 1A). Using 2PM of reactive LNs at early time points, we found that DOCK2−/− 2B4 T cells showed decreased motility throughout all observation periods compared with 2B4 T cells (between 4.3 and 6 μm/min, Fig. 1E, 1G). Nonetheless, similar to 2B4 T cells, DOCK2−/− 2B4 T cells colocalized with transferred DC-100 and DC-1000 in clusters around HEVs and in the paracortical area (Fig. 1B, Supplemental Videos 2, 3). Furthermore, DOCK2−/− 2B4 T cells had significantly higher percentages of stable interactions with DC-100 and DC-1000 compared with 2B4 T cells at virtually all time points analyzed, whereas their overall pattern of long-term interactions (>30 min) remained similar to 2B4 T cells (Fig. 1F, 1H, Supplemental Video 3). WT and DOCK2−/− T cell adhesion to DCs was strictly TCR driven, because in the absence of specific recognition of pMHC, rare DC interactions of WT and DOCK2−/− T cells lasted only 1.4 ± 0.7 and 3.2 ± 3.4 min, respectively (Supplemental Video 4). Our data show that parenchymal T cell motility is dispensable for contact initiation with dense paracortical DC networks. Rather, intrinsic DOCK2-mediated CD4+ T cell migration is required for dynamic kinapse-mediated signal integration in phase 1, and it prevents immediate transition to phase 2 when DCs display relatively low levels of cognate pMHC. Furthermore, absence of DOCK2-mediated motility prolongs CD4+ T cell–DC interactions at late time points, delaying phase 2–phase 3 transition. We correlated motility and interaction parameters of 2B4 and DOCK2−/− 2B4 T cells with their activation status at 24 h and proliferation at 48 h after T cell transfer by flow cytometry (Supplemental Fig. 1A, 1B). Unpulsed DCs (DC-0) or DCs pulsed with 10 nM MCC88–103 induced no or only a minor increase in CD69 and CD25 expression and no proliferation in transferred 2B4 and DOCK2−/− 2B4 T cells (Fig. 2, Supplemental Fig. 1C). At 100 nM pulsing, CD69 and CD25 expression became robustly detectable at 24 h posttransfer and increased with higher peptide concentration (Fig. 2A–D). Despite lower activation marker expression with DC-100 at early time points, 2B4 T cell proliferation was comparable to DC-1000 priming at 48 h posttransfer, suggesting that CD4+ T cell activation proceeded independently of the delayed onset of phase 2–like stable interactions (Fig. 2E). DOCK2−/− 2B4 T cells also increased CD69 and CD25 levels after DC-100 or DC-1000 priming, yet to a lower extent than 2B4 T cells (Fig. 2A–D). Accordingly, DOCK2−/− 2B4 T cells proliferated less than 2B4 T cells in the presence of DC-100, although this defect was rescued after DC-1000 priming (Fig. 2E). Based on our 2PM data showing comparable or even prolonged interactions of DOCK2−/− 2B4 T cells with DCs, their impaired activation most likely reflects defective formation of a mature IS and Rac-mediated costimulation in the absence of DOCK2 (45, 48). In vivo activation of 2B4 and DOCK2−/− 2B4 T cells at high DC density. 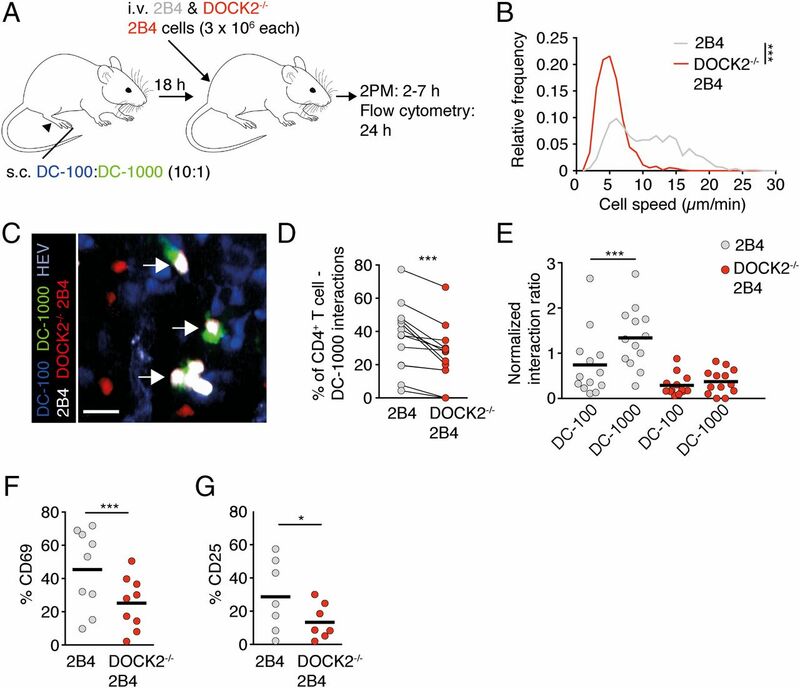 (A and B) Representative flow cytometry plots of CD69 and CD25 expression on 2B4 and DOCK2−/− 2B4 T cells 24 h posttransfer into control mice containing DC-0, DC-100, or DC-1000. Numbers indicate the percentage of CD69+ or CD25+ cells compared with isotype control (gray or red shading). (C and D) Percentage of CD69+ or CD25+ 2B4 and DOCK2−/− 2B4 T cells at 24 h posttransfer. (E) Percentage of proliferated 2B4 and DOCK2−/− 2B4 T cell at 48 h posttransfer. The boxes in (C)–(E) show 25th to 75th quartile with minimum/maximum values indicated by whiskers. The horizontal line represents the median. Data are pooled from four to seven independent experiments with a total of 6–14 mice and were analyzed using a Kruskal–Wallis test with the Dunn multiple-comparisons test against DC-0. For pairwise comparisons between 2B4 and DOCK2−/− 2B4 T cells per condition, we used an unpaired t test. *p < 0.05, **p < 0.01, ***p < 0.001. We examined flexible integration of DC-activation signals in an independent experimental model. To this end, we performed 2PM experiments using OVA323–339 peptide–specific OT-II T cells and DC-100 and DC-1000 (Fig. 3A), based on the observation that DCs pulsed with 10 nM MCC88–103 did not induce activation or proliferation (Supplemental Fig. 1C). 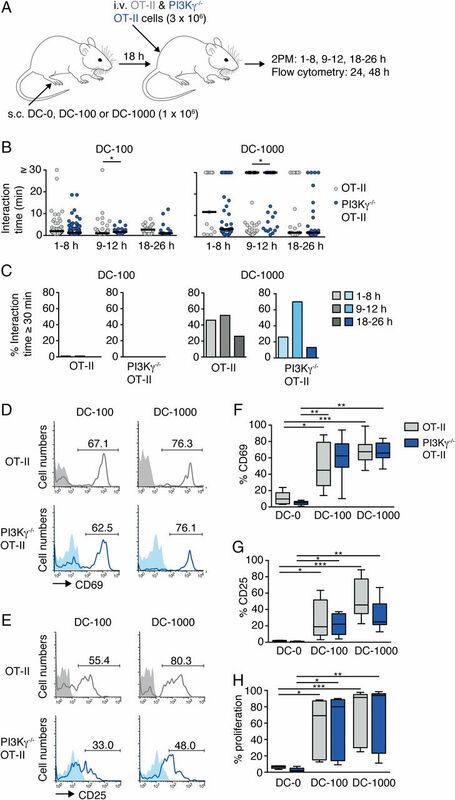 In contrast to 2B4 T cells, DC-100 did not induce stable interactions with OT-II T cells at any time window analyzed (1–8, 9–12, and 18–26 h post–T cell transfer), whereas they attached stably to DC-1000, particularly in the 9–12-h time window (Fig. 3B, 3C). Despite the lack of stable interactions under DC-100–priming conditions, OT-II T cells increased CD69 and CD25 levels 24 h posttransfer and proliferated multiple times at 48 h (Fig. 3D–H). We also compared activation of OT-II T cells lacking PI3Kγ because this isoform plays a minor, but detectable, role in parenchymal T cell motility (43). We found that the dynamic interactions of PI3Kγ−/− OT-II T cells with DC-100 and DC-1000 were similar to those of OT-II T cells (Fig. 3B, 3C). In agreement with this, PI3Kγ−/− OT-II T cells showed comparable CD69 upregulation and proliferation as OT-II T cells, with a nonsignificant tendency for reduced CD25 induction (Fig. 3D–H). Taken together, similar to CD8+ T cells (10, 11), CD4+ T cells adapt their phase-transition kinetics in a flexible PI3Kγ-independent DOCK2-dependent manner and are remarkably effective at integrating a wide range of cognate pMHC levels for activation. Thus, signal integration via motile kinapses is sufficient to drive CD4+ T cell proliferation in low pMHC conditions, even in the absence of detectable continuous synapses with DCs, whereas high pMHC levels bypass the necessity for prolonged signal integration and promote rapid arrest on DCs. In vivo DC interactions and activation of OT-II and PI3Kγ−/− OT-II T cells. (A) Experimental layout. OT-II and PI3Kγ−/− OT-II CD4+ T cells were transferred into mice that contained DC-100 or DC-1000. 2PM and flow cytometry of reactive LNs was performed at the indicated times. (B) Interaction times of OT-II and PI3Kγ−/− OT-II T cells with DC-100 and DC-1000 at the indicated times after T cell transfer. Horizontal lines indicate median. (C) Frequency of OT-II and PI3Kγ−/− OT-II T cell–DC interactions lasting >30 min at the indicated times after T cell transfer. (D and E) Representative flow cytometry plots of CD69 and CD25 expression 24 h post–OT-II and PI3Kγ−/− OT-II T cell transfer. Numbers indicate the percentage of CD69+ or CD25+ cells versus isotype control (gray or blue shading). (F and G) Percentage of CD69+ or CD25+ OT-II and PI3Kγ−/− OT-II T cells 24 h posttransfer. (H) Percentage of proliferated OT-II and PI3Kγ−/− OT-II T cells 48 h posttransfer. The boxes in (F)–(H) show 25th to 75th quartile with minimum/maximum values indicated by whiskers. The horizontal lines represent the median. Data in (B) and (C) are pooled from two to four independent experiments with two to four mice per time point and DC-pulsing condition. Data in (B) were analyzed using a Mann–Whitney U test. Data in (D)–(H) are pooled from two to five independent experiments with a total of 4–11 mice per condition and were analyzed using a Kruskal–Wallis test with the Dunn multiple-comparisons test against no DCs. For pairwise comparisons between OT-II and PI3Kγ−/− OT-II T cells per condition, we used an unpaired t test. *p < 0.05, **p < 0.01, ***p < 0.001. Continuous CD4+ T cell motility limited early interactions with DC-100, leading us to investigate the biological significance of this behavior. Specifically, we examined whether phase 1 sampling was not only a strategy for sequential signal integration of low pMHC-presenting DCs, but also for selective detection of occasional DCs with high cognate pMHC levels. We performed 2PM experiments in which we simultaneously transferred DC-100 and DC-1000 at a 10:1 ratio and evaluated how efficiently 2B4 and DOCK2−/− 2B4 T cells accumulated at the less abundant DC-1000 during the first 2–7 h posttransfer (Fig. 4A). We confirmed that 2B4 T cells and DOCK2−/− 2B4 T cells showed similar sampling behavior as under DC-100–only conditions (10.6 ± 4.7 and 5.1 ± 2.1 μm/min, respectively, Fig. 4B), with DOCK2 deficiency correlating with a strongly reduced motility coefficient (10.2 μm2/min for 2B4 T cells versus 1.6 μm2/min for DOCK2−/− 2B4 T cells). Furthermore, 2PM image sequences suggested a higher likelihood that 2B4 T cells attach to rare DC-1000 (Fig. 4C, Supplemental Video 5). To quantify this trend, we calculated the percentage of DC-1000 interactions from all T cell–DC interactions (defined as contact ≥ 1 min) for each cell population. Despite variability between the image sequences analyzed owing to fluctuations in the absolute numbers and spatial distribution of transferred DCs in the field of view (FOV), DOCK2−/− 2B4 T cells were consistently interacting less frequently with DC-1000 compared with 2B4 T cells (Fig. 4C, 4D, Supplemental Video 5). To account for variations between image sequences, we normalized the number of 2B4 T cell and DOCK2−/− 2B4 T cell contacts to the absolute number of DC100 or DC-1000 detected per FOV. 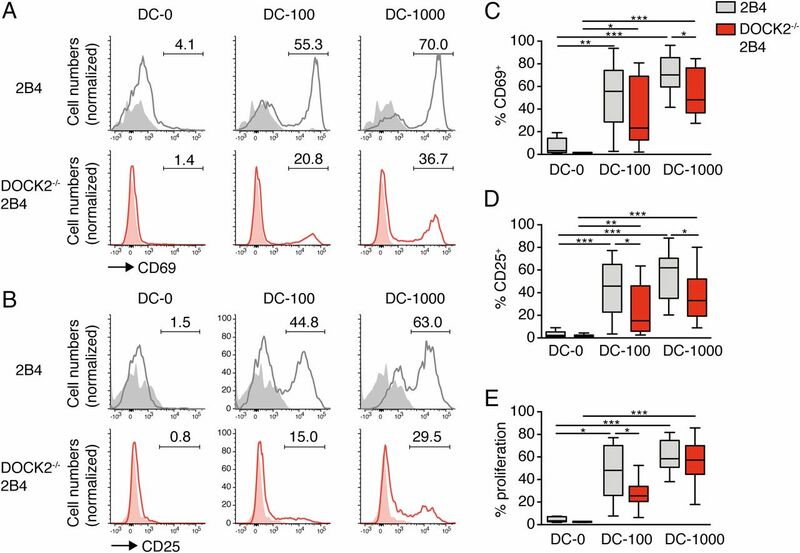 This analysis confirmed the preferential accumulation of 2B4 T cells at DC-1000, whereas no significant trend was detected for DOCK2−/− 2B4 T cells (Fig. 4E). This correlated with decreased CD69 and CD25 expression levels on DOCK2−/− 2B4 T cells compared with 2B4 T cells 24 h after T cell transfer (Fig. 4F, 4G). In sum, our findings show that DOCK2-dependent motility promotes T cell detachment from DCs with suboptimal pMHC levels as a necessary step for the selective identification and accumulation at “optimal” rare DCs. Motility facilitates CD4+ T cell scanning for optimal DC selection at high DC densities. (A) Experimental layout. 2B4 and DOCK2−/− 2B4 CD4+ T cells were transferred into mice that contained a 10:1 mix of DC-100/DC-1000. (B) Frequency distribution of 2B4 and DOCK2−/− 2B4 T cell speeds 2–7 h after T cell transfer. (C) Representative 2PM projection showing 2B4 T cells interacting with DC-1000 (arrows). Scale bar, 15 μm. (D) Percentage of 2B4 and DOCK2−/− 2B4 T cells interacting with DC-1000 3–7 h after T cell transfer. Each connected pair of data was obtained from an individual image sequence (i.e., 2B4 and DOCK2−/− 2B4 T cells always had the same number of DC-1000 available). (E) Interaction ratio of 2B4 and DOCK2−/− 2B4 T cells after normalization to the total number of DC-100 or DC-1000 in the FOV. Horizontal lines represent the mean. (F and G) Percentage of CD69+ and CD25+ 2B4 and DOCK2−/− 2B4 T cells in reactive LNs 24 h after T cell transfer. Each dot represents a reactive LN from one mouse. Data in (B)–(E) are pooled from three independent experiments with four mice, and data in (F) and (G) are from three independent experiments with one to three mice each. Data in (B) were analyzed using the Mann–Whitney U test, and data in (D) were analyzed using a paired Wilcoxon test. Data in (E)–(G) were analyzed using a paired t test. *p < 0.05, ***p < 0.001. In the experimental settings used thus far, we had transferred high amounts of pulsed DCs that facilitated T cell contact, irrespective of DOCK2-mediated motility. This was necessary to obtain sufficient cell numbers per FOV for a meaningful analysis of 2PM image sequences. Yet at the onset of an immune response, the number of cognate pMHC-presenting DCs is limited. To understand how impaired T cell migration affects DC encounters under such conditions, we built a computational model by extrapolating control and DOCK2−/− T cell tracks from 2PM experiments performed in the absence of DCs. We then simulated how many of 100 synthetic tracks led to encounters of low (50) and high (104) numbers of DCs randomly distributed in a spherical T cell zone of 1 mm diameter in 8 h (Fig. 5A). Our estimate of 104 DCs is based on absolute DC numbers recovered from draining LNs after s.c. injection of 1 × 106 DCs (55), which we have used for 2PM experiments. At high DC densities, the vast majority of synthetic control and DOCK2−/− T cells tracks had encountered DCs within 8 h (99.6 and 97.5% in 50 simulations, respectively, Fig. 5B), in line with our 2PM observations. When we seeded only 50 DCs, 20.9% of control T cells encountered at least one DC within 8 h, whereas only 2.3% of virtual DOCK2−/− T cells encountered a DC at the same rate (Fig. 5B). In sum, our modeling suggests that, under conditions of low DC density, DOCK2-driven motility is required for efficient DC encounters. CD4+ T cell migration is required to detect rare DCs scattered in lymphoid tissue. (A) Example of synthetic tracks derived from control (gray) or DOCK2−/− (red) T cell data in spherical T cell area with dispersed DCs (green). Numbers are micrometers. (B) Percentage of 100 synthetic tracks encountering ≥1 in 50 or 104 DCs in 50 8-h simulations. (C) Experimental layout for whole-organ analysis of rare T cell–DC interactions. (D) Example of whole-mount LN reconstruction with transferred DC-1000 (green), 2B4 (white), and DOCK2−/− 2B4 (red) T cells. The HEV network is depicted in blue. Scale bar, 200 μm. (E) Single XY plane showing a 2B4 T cell–DC interaction (arrow). Scale bar, 200 μm. (F) Total number of transferred cells per LN. Each dot represents one LN. (G) Percentage of 2B4 and DOCK2−/− 2B4 T cells with centroid distances of less than 20 μm of DC-1000 at 8 h posttransfer per LN. (H and I) Percentage of CD69+ or CD25+ 2B4 and DOCK2−/− 2B4 T cells 24 h posttransfer. Data in (F)–(H) are from two independent experiments with five to eight mice, whereas data in (I) are from one experiment with five mice. Horizontal lines in (F)–(I) represent the mean. Data in (G) were analyzed using a Mann–Whitney U test, and data in (H) and (I) were analyzed using a Wilcoxon matched-pair ranking test. *p < 0.05, **p < 0.01. To validate this prediction, we used three-dimensional reconstructions of entire LNs generated by SPIM after transfer of low numbers of T cells and DC-1000 (Fig. 5C) (55). This approach enabled us to determine numbers and (x, y, z) coordinates of individual T cells and DCs in reactive LNs (Fig. 5D, 5E), identifying 35–197 cells of each cell type per LN (Fig. 5F, Supplemental Video 6). To examine organ-wide T cell–DC interaction frequencies, we performed an automated T cell centroid distance analysis to the nearest DC-1000, using 20 μm as cutoff for bona fide Ag-driven interactions, as determined in our previous calibration studies (55). In agreement with our computational model, we found that, at 8 h post–T cell transfer, almost 20% of 2B4 T cells (18.1 ± 9.6%) were in contact with rare DC-1000. In contrast, only 5.8 ± 1.6% of DOCK2−/− 2B4 T cells were in close proximity to DC-1000 (Fig. 5G). This correlated with strongly decreased CD69 and CD25 expression in DOCK2−/− 2B4 T cells compared with 2B4 T cells (Fig. 5H, 5I). To dissect the relative contributions of DOCK2 activity to TCR signaling versus DC encounter, we compiled CD69 and CD25 expression ratios for all conditions (i.e., high and low pMHC levels and high and low DC densities) applied in 2PM and SPIM experiments. Despite comparable or even prolonged interactions during high-density DC priming, the percentage of CD69+ DOCK2−/− 2B4 T cells was reduced to 77 ± 15% (mean ± SEM) and 76 ± 7% of 2B4 T cell levels (with DC-1000 and DC-100, respectively). This reduction represents defects in TCR signaling in DOCK2−/− T cells that occur independent of DC encounter frequency. Similarly, using 10:1 spiking of DC-100 with DC-1000, the percentage of CD69+ DOCK2−/− 2B4 T cells was 51 ± 5% of 2B4 T cell levels. In contrast, low-density DC-1000 priming precipitated a loss of CD69+ DOCK2−/− 2B4 T cells to only 21% of 2B4 T cell levels (Fig. 6A), whereas CD25 expression levels sank to 18 ± 6% of 2B4 T cells (Fig. 6B). The additional reduction in DOCK2−/− activation parameters under low-abundance DC conditions directly demonstrates the importance of active T cell scanning to intercept rare Ag-presenting DCs. In sum, our data uncover a central function for DOCK2-mediated motility for rare DC sampling, in addition to its migration-independent function during TCR signal transduction (45, 48). T cells require DOCK2 for optimal TCR signaling and encountering rare DCs in vivo. Ratios of CD69+ (A) and CD25+ (B) DOCK2−/− 2B4 over 2B4 T cells compiled from all conditions tested. The dashed line indicates “equal to WT levels.” **p < 0.01, ***p < 0.001, one-way ANOVA with Tukey comparison test. The first aim of this study was to comprehensively analyze how variations in pMHC levels affected kinapse-type versus synapse-type transitions during the first 24 h of CD4+ T cell contact with DCs and how this correlated with subsequent activation parameters. We found that interactions between CD4+ T cells and DCs depend on Ag availability, covering a wide range from almost instant stable arrest (i.e., without phase 1–like signal integration) to a lack of phase 2–like stable interactions. Thus, similar to CD8+ T cells, CD4+ T cells do not “hardwire” their interaction behavior with DCs but flexibly integrate varying levels of cognate pMHC densities for clonal expansion above a pMHC threshold. The second aim was to examine the relevance of high parenchymal CD4+ T cell motility for immunosurveillance by analyzing the roles of two independently acting promigratory signaling molecules: PI3Kγ and DOCK2. Although we did not identify a significant role for PI3Kγ during dynamic CD4+ T cell interactions with DCs and early activation, DOCK2−/− CD4+ T cells were impaired in their activation due to defective TCR signaling and reduced motility. Our findings provide experimental evidence for the hypothesis that dynamic CD4+ T cell motility plays a dual role in facilitating interactions with DCs bearing high pMHC levels by preventing their arrest at “suboptimal” DCs and when rare DCs are scattered throughout lymphoid tissue. Previous work has shown that CD8+ T cells regulate the duration of their interactions with DCs in a flexible, pMHC-level–dependent manner (10, 11). Remarkably, early CD8+ T cell activation parameters were comparable when pMHC levels were above a threshold density, although lack of phase 2–like interactions impaired memory formation (11). In this article, we show in two independent TCR-tg systems that CD4+ T cells also regulate the transition from motile kinapse-like to long-term synapse-like interactions in a pMHC level–dependent manner and are able to expand in the absence of stable in vivo interactions, similar to previous in vitro observations (56, 57). Therefore, dynamic pMHC level–dependent occurrence and timing of stable interactions with DCs is a universal feature of CD4+ and CD8+ T cells. In the two CD4+ TCR-tg systems we have used, CD4+ T cell activation required significantly higher peptide concentrations than reported for TCR-tg CD8+ T cells, although this is not necessarily the case for other TCR-tg CD4+ T cells (58). For 2B4 and OT-II CD4+ T cells, this may be due to variations in pMHC half-life or peptide registers in the MHC groove or to differences in the efficacy of self-pMHC recognition (59–63). In any case, the observation that CD4+ T cells stably interact with DCs after s.c. protein immunization suggests that the pulsing conditions used in this study overlap with physiological pMHC levels (12, 35). The comparable early CD4+ T cell expansion after stable synapse-like and transient kinapse-like interactions supports the presence of a defined critical signal threshold leading to proliferation (64). How CD4+ T cells biochemically store signals of transient pMHClow DC encounters in vivo has not been investigated, although phosphorylated c-fos has been shown in vitro to serve as a rheostat of previous DC encounters (65). Similarly, NFAT translocation and Akt phosphorylation are involved in CD8+ T cell signal integration and may play comparable roles in CD4+ T cells (66, 67). Yet although a lack of stable interactions can lead to CD4+ T cell proliferation in the presence of a dense paracortical DC network presenting low levels of cognate pMHC, prolonged exposure to high cognate pMHC levels is likely to be important for full CD4+ differentiation and memory formation (17, 68, 69). We have previously shown that PI3Kγ contributes to maintaining directionality without affecting T cell speed (43). Furthermore, PI3Kγ has been implicated in T cell activation in some (70–72), but not all (73, 74), studies. In the conditions used in this study, our 2PM analysis and functional readout does not provide support for a major role for PI3Kγ in early T cell activation, although we did not analyze the activation status of CD4+ T cells beyond 48 h. Our results are compatible with the observation that early PI3K signaling downstream of the TCR is primarily mediated by the PI3Kδ isoform (75, 76). Yet PI3Kγ signaling plays a role during subsequent differentiation of CD4+ T cells to Th1, Th17, and Th2 cells (71), and it could conceivably also contribute to transmission of prosurvival signals to naive T cells via CCR7 activation (77). Absence of DOCK2 leads to altered T cell activation, as shown by defective TCR accumulation at the IS, impaired allograft rejection and Th1 responses, and exacerbated Th2 responses in DOCK2-deficient mice (45, 47, 78). Furthermore, defective DOCK2 expression is linked to severe early-onset immunodeficiency in humans, although additional immune cells beyond T cells are affected in these patients (49). Yet when we transferred high numbers of DCs s.c., we observed robust homing of DOCK2−/− T cells to reactive LNs, where they were in close contact with paracortical DCs. Such interactions could conceivably have been initiated by their actively probing dendrites (79, 80). This argues against a migration-related defect under conditions of high DC density, as confirmed by our in silico analysis. Rather, our 2PM experiments showed that the absence of the promigratory DOCK2–Rac1/2 axis precipitated synapse-like T cell interactions with pMHClow DCs. Furthermore, detachment from DCs was delayed in the absence of DOCK2, leading to prolonged interaction times. The observation that DOCK2 is required for CD4+ T cell detachment from DCs, coinciding with increased motility in phase 3, is reminiscent of in vitro findings where chemotactic gradients interfere with T cell–APC interactions (6, 32). Nonetheless, we found that pMHC levels imprinted similar (if prolonged) patterns of stable DOCK2−/− T cell interactions with DCs, as seen in WT T cells, arguing that DOCK2−/− T cells were actively interacting with DCs and not just passively juxtaposed to these cells. This is in line with the observation that LFA-1 translocation to the IS of DOCK2−/− T cells is comparable to WT T cells (45). Importantly, the reduced activation and proliferation of DOCK2−/− CD4+ T cells under conditions of high DC density allow us to assign a migration-independent role for TCR-triggered DOCK2-mediated Rac activation leading to efficient T cell activation in vivo. The continuous scanning of DCs by naive T cells in lymphoid tissue has led to the paradigm that this search strategy is required for efficient encounters with DCs (2, 28, 30, 81). However, direct experimental evidence has remained elusive. Taking advantage of whole-mount SPIM imaging to identify low numbers of adoptively transferred DCs and CD4+ T cells, we were able to create conditions to separate the cell-intrinsic defect of DOCK2 deficiency on TCR signaling from its effect on the “random guided walk” search strategy of CD4+ T cells (82). Our data expose that, under conditions of low DC density, DOCK2−/− T cell encounters with cognate DCs are significantly impaired, leading to an 80% reduction in CD4+ T cell activation. Such a scenario is conceivable when limited numbers of cognate pMHC-presenting LN-resident or migratory DCs are present and when T cells require chemotactic guidance to encounter these rare cells (83). Yet high DC numbers are able to compensate for low T cell motility, indicating that such conditions rapidly decrease the time leading to CD4+ T cell activation. This is likely the case at the peak of the immune response, when DC influx from sites of inflammation is highest. The strategic localization of these DCs around HEVs (8, 34, 35), as well as the capture of lymphocytes by probing dendrites from DCs (79, 80), may further shorten the time for T cell–DC encounters in inflamed LNs. In sum, our 2PM and whole-mount LN approach using a combination of WT and gene-deficient TCR-tg CD4+ T cells has clarified the relevance of pMHC levels on activated DCs, a well as their density, for efficient and rapid CD4+ T cell interactions. DOCK2-driven PI3Kγ-independent CD4+ T cell motility in LNs is highly relevant at the onset of immune responses with low DC densities, while contributing to detachment from DCs presenting suboptimal pMHC densities. We thank Emilio Hirsch for PI3Kγ-deficient mice. Microscopy was performed on equipment supported by the Microscopy Imaging Center, University of Bern. This work was supported by Swiss National Foundation Grant 31003A_135649 (to J.V.S. ), Sinergia Grants CR23I3_156234 and CRSII3_141918 (to J. Sharpe and J.V.S. ), European Commission FP7 Marie Curie Reintegration Grant 276702 (to J.V.S. ), and a Japanese-Swiss Science and Technology Program Grant (to Y.F. and J.V.S.). J.A. was supported by a Postdoctoral Fellowship for Research Abroad from the Japan Society for the Promotion of Science. J.R. acknowledges support from European Commission FP7 Career Integration Grant HIGH-THROUGHPUT TOMO and MINECO Grant FIS2013-41802-R MESO-IMAGING. P.G., J. Swoger, and J. Sharpe acknowledge support from the Spanish Ministry of Economy and Competitiveness, Centro de Excelencia Severo Ochoa 2013–2017, SEV-2012-0208. The selective plane illumination microscopy setup was financed by a grant from the Pierre Mercier Foundation.
. 2003. A stochastic view of lymphocyte motility and trafficking within the lymph node. Immunol. Rev. 195: 136–159.
. 2007. Highways, byways and breadcrumbs: directing lymphocyte traffic in the lymph node. Trends Immunol. 28: 346–352.
. 2004. Intravital microscopy: visualizing immunity in context. Immunity 21: 315–329. 2010. Dynamics of dendritic cell-T cell interactions: a role in T cell outcome. Semin. Immunopathol. 32: 227–238. 2008. T-cell activation through immunological synapses and kinapses. Immunol. Rev. 221: 77–89.
. 2012. Dynamic in situ cytometry uncovers T cell receptor signaling during immunological synapses and kinapses in vivo. Immunity 37: 351–363.
. 2003. Dynamics of CD8+ T cell priming by dendritic cells in intact lymph nodes. Nat. Immunol. 4: 579–585.
. 2008. T cell sensing of antigen dose governs interactive behavior with dendritic cells and sets a threshold for T cell activation. Nat. Immunol. 9: 282–291.
. 2013. Antigen availability determines CD8+ T cell-dendritic cell interaction kinetics and memory fate decisions. Immunity 39: 496–507.
. 2002. Two-photon imaging of lymphocyte motility and antigen response in intact lymph node. Science 296: 1869–1873.
. 2002. Dynamic imaging of T cell-dendritic cell interactions in lymph nodes. Science 296: 1873–1876.
. 2004. Imaging the single cell dynamics of CD4+ T cell activation by dendritic cells in lymph nodes. J. Exp. Med. 200: 847–856.
. 2005. 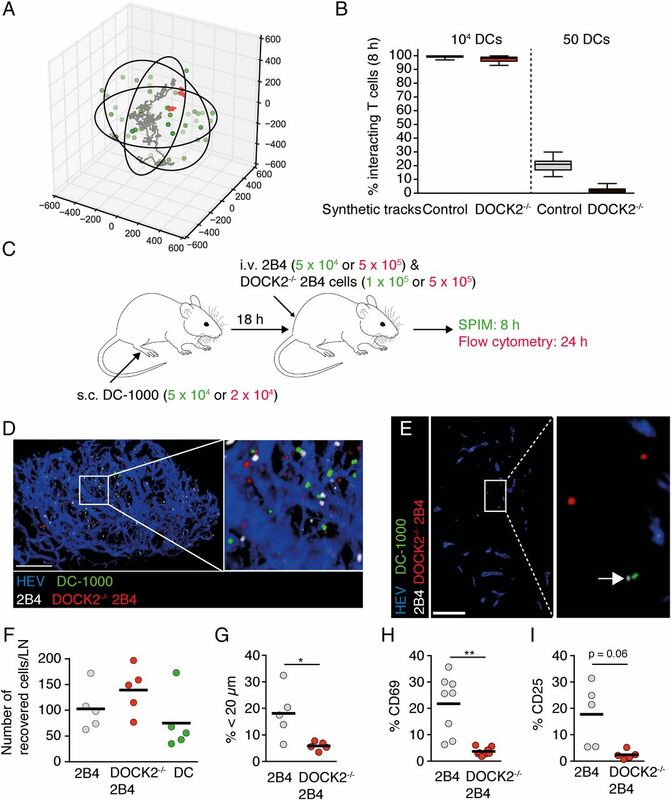 CD4 T cells integrate signals delivered during successive DC encounters in vivo. J. Exp. Med. 202: 1271–1278.
. 2007. Peptide-MHC potency governs dynamic interactions between T cells and dendritic cells in lymph nodes. Nat. Immunol. 8: 835–844.
. 2012. Distinct influences of peptide-MHC quality and quantity on in vivo T-cell responses. Proc. Natl. Acad. Sci. USA 109: 881–886.
. 2014. Thromboxane A2 acts as tonic immunoregulator by preferential disruption of low-avidity CD4+ T cell-dendritic cell interactions. J. Exp. Med. 211: 2507–2517. 2002. Interactions between MHC molecules and co-receptors of the TCR. Curr. Opin. Immunol. 14: 75–83.
. 2003. JNK and p38 MAP kinases in CD4+ and CD8+ T cells. Immunol. Rev. 192: 131–142.
. 2001. Naive CTLs require a single brief period of antigenic stimulation for clonal expansion and differentiation. Nat. Immunol. 2: 423–429.
. 2003. Continuous T cell receptor signaling required for synapse maintenance and full effector potential. Nat. Immunol. 4: 749–755.
. 2005. Distinct temporal programming of naive CD4+ T cells for cell division versus TCR-dependent death susceptibility by antigen-presenting macrophages. Eur. J. Immunol. 35: 449–459.
. 2012. TCR signaling requirements for activating T cells and for generating memory. Cell. Mol. Life Sci. 69: 1565–1575.
. 2012. Quantification of lymph node transit times reveals differences in antigen surveillance strategies of naive CD4+ and CD8+ T cells. Proc. Natl. Acad. Sci. USA 109: 18036–18041.
. 2008. Making friends in out-of-the-way places: how cells of the immune system get together and how they conduct their business as revealed by intravital imaging. Immunol. Rev. 221: 163–181.
. 2010. Agent-based simulation of T-cell activation and proliferation within a lymph node. Immunol. Cell Biol. 88: 172–179.
. 2014. Random migration and signal integration promote rapid and robust T cell recruitment. PLOS Comput. Biol. 10: e1003752.
. 2014. Detection of rare antigen-presenting cells through T cell-intrinsic meandering motility, mediated by Myo1g. Cell 158: 492–505.
. 2000. Cutting edge: hierarchy of chemokine receptor and TCR signals regulating T cell migration and proliferation. J. Immunol. 165: 15–19. 2004. Stop and go traffic to tune T cell responses. Immunity 21: 305–314.
. 2003. The strategy of T cell antigen-presenting cell encounter in antigen-draining lymph nodes revealed by imaging of initial T cell activation. J. Exp. Med. 198: 715–724.
. 2005. Stable T cell-dendritic cell interactions precede the development of both tolerance and immunity in vivo. Nat. Immunol. 6: 707–714.
. 2006. Extrafollicular activation of lymph node B cells by antigen-bearing dendritic cells. Science 312: 1672–1676.
. 2009. Mechanical modes of ‘amoeboid’ cell migration. Curr. Opin. Cell Biol. 21: 636–644.
. 2009. Rho family GTPases and their regulators in lymphocytes. Nat. Rev. Immunol. 9: 630–644.
. 2013. Immune regulatory functions of DOCK family proteins in health and disease. Exp. Cell Res. 319: 2343–2349.
. 2014. Dock-family exchange factors in cell migration and disease. Eur. J. Cell Biol. 93: 466–477.
. 2007. Class IA phosphoinositide 3-kinase modulates basal lymphocyte motility in the lymph node. J. Immunol. 179: 2261–2269.
. 2004. Differential requirements for DOCK2 and phosphoinositide-3-kinase gamma during T and B lymphocyte homing. Immunity 21: 429–441.
. 2007. A central role for DOCK2 during interstitial lymphocyte motility and sphingosine-1-phosphate-mediated egress. J. Exp. Med. 204: 497–510.
. 2003. DOCK2 is essential for antigen-induced translocation of TCR and lipid rafts, but not PKC-theta and LFA-1, in T cells. Immunity 19: 119–129.
. 2013. Annular PIP3 accumulation controls actin architecture and modulates cytotoxicity at the immunological synapse. J. Exp. Med. 210: 2721–2737.
. 2007. T helper type 2 differentiation and intracellular trafficking of the interleukin 4 receptor-alpha subunit controlled by the Rac activator Dock2. Nat. Immunol. 8: 1067–1075.
. 2009. CCL21 mediates CD4+ T-cell costimulation via a DOCK2/Rac-dependent pathway. Blood 114: 580–588.
. 2015. Inherited DOCK2 deficiency in patients with early-onset invasive infections. N. Engl. J. Med. 372: 2409–2422.
. 2000. Central role for G protein-coupled phosphoinositide 3-kinase gamma in inflammation. Science 287: 1049–1053.
. 2011. Scikit-learn: machine learning in Python. J. Machine Learning Res. 12: 2825–2830. McKinney, W. 2010. Data structures for statistical computing in Python. Proceedings of the 9th Python in Science Conference. p. 51–56. Available at: https://conference.scipy.org/proceedings/scipy2010/pdfs/mckinney.pdf. Accessed: March 1, 2016. Waskom, M., K. Meyer, P. Hobson, Y. Halchenko, M. Koskinen, A. Miles, D. Wehner, O. Botvinnik, T. Megies, cynddl, et al. 2014. seaborn: v0.5.0 (November 2014). Available at: https://zenodo.org/record/12710#.WTWBw-vyuM8. Accessed: March 1, 2016.
. 2016. Light sheet fluorescence microscopy for in situ cell interaction analysis in mouse lymph nodes. J. Immunol. Methods 431: 1–10.
. 2000. Antigen presentation in extracellular matrix: interactions of T cells with dendritic cells are dynamic, short lived, and sequential. Immunity 13: 323–332.
. 2003. Cutting edge: T lymphocyte activation by repeated immunological synapse formation and intermittent signaling. J. Immunol. 171: 1128–1132.
. 2007. Real-time manipulation of T cell-dendritic cell interactions in vivo reveals the importance of prolonged contacts for CD4+ T cell activation. Immunity 27: 625–634.
. 2004. Peptide register shifting within the MHC groove: theory becomes reality. Mol. Immunol. 40: 1033–1039.
. 2005. The kinetic stability of MHC class II:peptide complexes is a key parameter that dictates immunodominance. Immunity 23: 29–40.
. 2015. T cell receptor cross-reactivity between similar foreign and self peptides influences naive cell population size and autoimmunity. Immunity 42: 95–107.
. 2013. T cell-positive selection uses self-ligand binding strength to optimize repertoire recognition of foreign antigens. Immunity 38: 263–274.
. 2015. The TCR’s sensitivity to self peptide-MHC dictates the ability of naive CD8(+) T cells to respond to foreign antigens. Nat. Immunol. 16: 107–117.
. 2014. A sharp T-cell antigen receptor signaling threshold for T-cell proliferation. Proc. Natl. Acad. Sci. USA 111: E3679–E3688.
. 2011. A role for the immediate early gene product c-fos in imprinting T cells with short-term memory for signal summation. PLoS One 6: e18916.
. 2013. The transcription factor NFAT exhibits signal memory during serial T cell interactions with antigen-presenting cells. Immunity 38: 237–249.
. 2007. Sustained antigen presentation can promote an immunogenic T cell response, like dendritic cell activation. Proc. Natl. Acad. Sci. USA 104: 15460–15465.
. 2014. Antigen affinity and antigen dose exert distinct influences on CD4 T-cell differentiation. Proc. Natl. Acad. Sci. USA 111: 14852–14857.
. 2007. Phosphoinositide 3-kinase gamma participates in T cell receptor-induced T cell activation. J. Exp. Med. 204: 2977–2987.
. 2013. PI3Kγ kinase activity is required for optimal T-cell activation and differentiation. Eur. J. Immunol. 43: 3183–3196.
. 2015. Phosphatidylinositol 3-kinase γ is required for the development of experimental cerebral malaria. PLoS One 10: e0119633.
. 2008. Selective regulation of CD8 effector T cell migration by the p110 gamma isoform of phosphatidylinositol 3-kinase. J. Immunol. 180: 2081–2088.
. 2010. Loss of phosphoinositide 3-kinase gamma decreases migration and activation of phagocytes but not T cell activation in antigen-induced arthritis. BMC Musculoskelet. Disord. 11: 63.
. 2003. PI3K in lymphocyte development, differentiation and activation. Nat. Rev. Immunol. 3: 317–330.
. 2015. PI3K signalling in inflammation. Biochim. Biophys. Acta 1851: 882–897.
. 2005. Deletion of DOCK2, a regulator of the actin cytoskeleton in lymphocytes, suppresses cardiac allograft rejection. J. Exp. Med. 202: 1121–1130.
. 2004. T cell repertoire scanning is promoted by dynamic dendritic cell behavior and random T cell motility in the lymph node. Proc. Natl. Acad. Sci. USA 101: 998–1003.
. 2008. Intercellular adhesion molecule-1-dependent stable interactions between T cells and dendritic cells determine CD8+ T cell memory. Immunity 28: 258–270.
. 2012. The race for the prize: T-cell trafficking strategies for optimal surveillance. Blood 120: 1432–1438.
. 2012. Chemotactic migration of T cells towards dendritic cells promotes the detection of rare antigens. PLOS Comput. Biol. 8: e1002763.